Our arrival was perfectly timed with a dawn entry into the Nakama Creek in Savusavu bay, Vanua Levu. 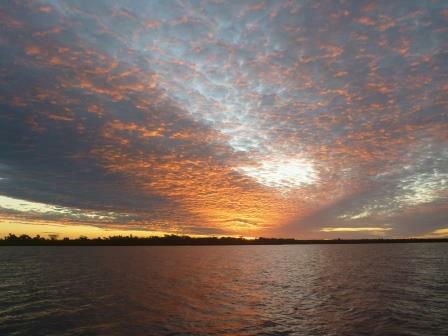 Crossing the bay was very calm as the entrance is protected by a reef .The Copra Shed Marina is in the mouth of the creek and we were greeted by a helper who tied us up to a mooring buoy in the river … a wonderful welcome. 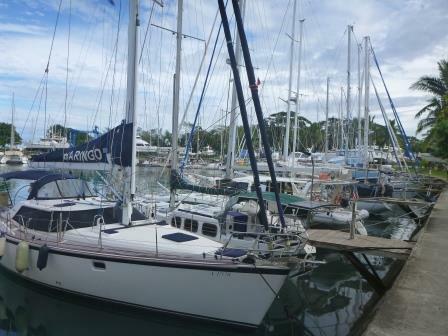 We were later helped onto a marina berth which we chose so we did not have to mantle our new large dinghy! 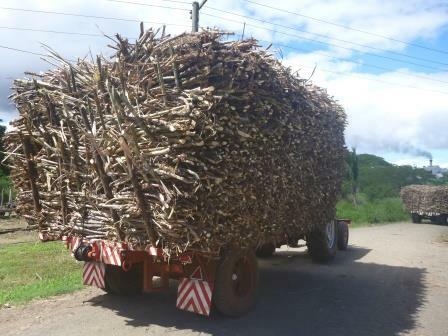 Next was the usual customs and immigration and also biosecurity but all the officials came to the boat and there were no problems at all. 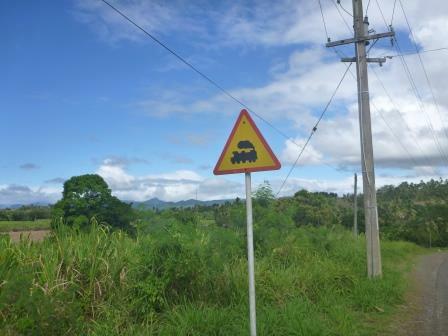 Luckily one of John’s old school friends has a house on Vanua Levu which happens to be next door to the marina owner Geoff so we made his acquaintance that morning and the next day took us on a tour to see Richard’s house and his own. Both had wonderful views over the bay even on a gray day. It was rainy and grey but never the less interesting to have the local perspective. 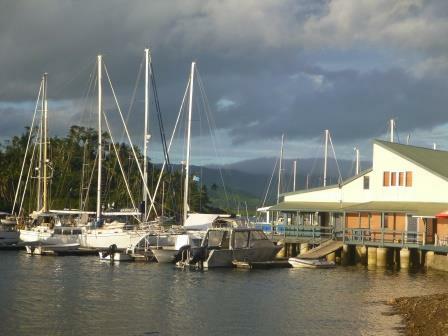 The marina as its name implies is the old Copra Wharf and the oldest building in Savusavu and it has been tastefully restored as a marina and yacht club with a restaurant, café ,chandlery and gift shop and of course a bar where all proceed go to help children learn to sail . A good excuse for having that extra drink!! 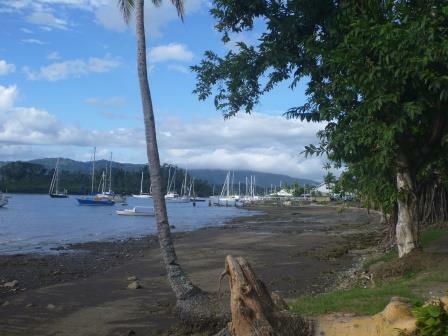 The marina is 5 minutes walk from Savusavu which has a dilapidated appeal but also an excellent market, many hardware shops and good supermarkets so all yachting needs were very adequately provided for. 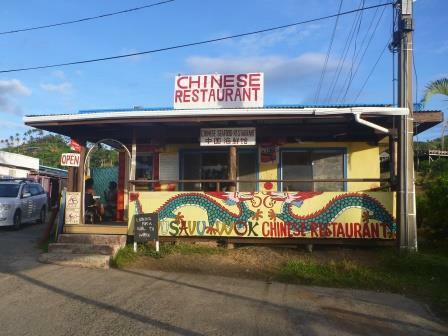 Savusavu Chinese restaurant- home from home! 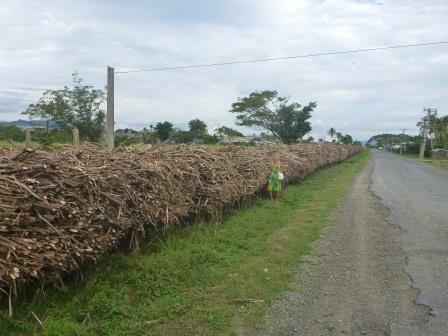 We hired a car for two days and drove to the north of the island to Lebasa Fiji’s second city which was like a larger version of Savusvau but very much more indian so we enjoyed a delicious roti for lunch .It was unfortunately a cloudy day so we did not see the views driving over the hills between the two towns but we saw the sugar cane factory belching smoke and all the sugar cane lorries queueing up to deliver their loads. 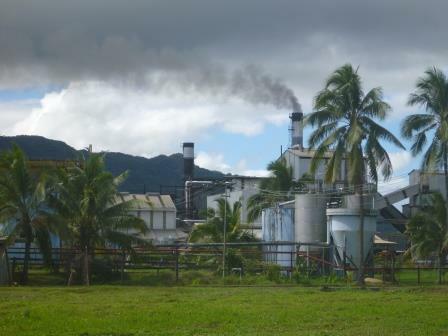 It is Fiji’s main industry. 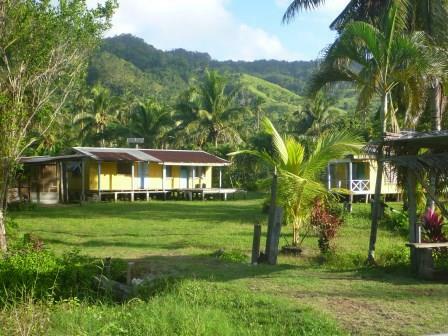 On our return we decided to try the coastal route and discovered the delightful Palmlea eco lodge run by ex cruisers so very interesting to talk to. Time as always was passing quickly so we had to leave on Thursday 11th August so as John snatched a few minutes watching the Olympic rugby I bought provisions in the market which was full of every fruit and vegetable you could want, really excellent . 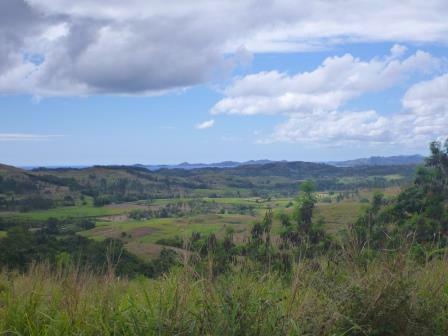 We set off westwards across Fiji on the route recommended by Geoff and one we certainly would not have undertaken without his guidance and advice knowing he had done it many times before . This saved us many miles and although it had looked very tricky on the charts with so many reefs it was in fact very easy although a bit rougher than expected as the reefs did not seem to provide as much protection from the swell as we though. 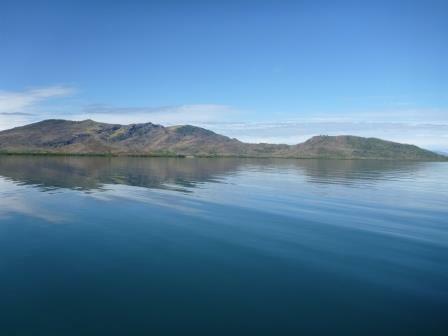 However by the end of the first day after crossing Vatu I-ra channel between Vanua Levu and Viti Levu in 40 kts wind we arrived at the inner passage on the north of Viti Levu and all was wonderfully calm. We had a peaceful night at anchor off Volivoli point a rather lovely bay as recommended by Geoff .We set off early the next morning to reach Vudu Point marina and had a tranquil and very pleasant motor sail through the inside passage. We decided to anchor once again rather than go to the marina that evening. John chose Saweni Bay between Lautoka and Vudu Point, there was a sandy beach and we swam and enjoyed a wonderful sunset followed by a moonlit night and realised why we were cruising! All the rough throwing around seemed like a distant memory. We reached Vudu Point marina the next morning at low tide but just made it through the dredged passage and were again helped onto the berth .The marina is in a lagoon and is circular with a concrete wall around the edge. We went bow to the circular wall wondering how we would get ashore but the berths are adjacent to a platform that protrudes from the concrete wall at deck level so very easy to climb ashore. 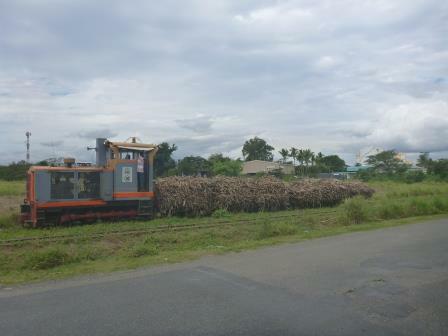 Work started on cleaning the boat, checking the usual things and preparing for the next voyage to Vanuatu to meet with Bob and Sandie Llewellin. 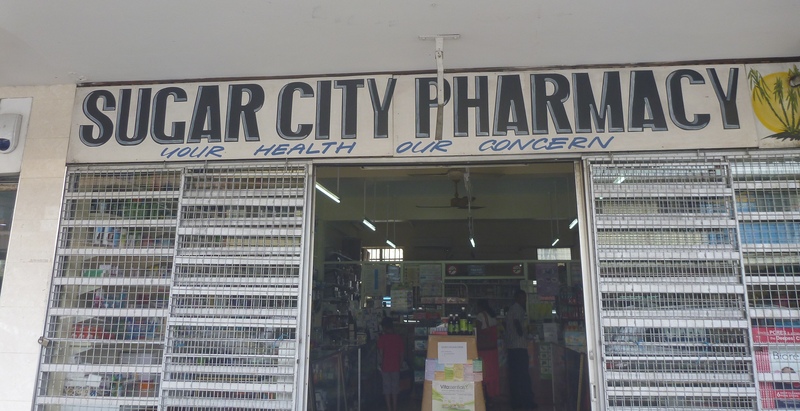 Again we were delayed by weather so we went to Lautoka the second city of Fiji known as sugar city and provisioned in the excellent market .It is pleasantly laid out with wide streets and tree lined boulevards . We hope to leave tomorrow 18th August but it may be a wet journey at least initially … the pilot saloon may come into its own !